It’s become something of a sad mantra for my writing group and many friends as of late. See, it’s like this. Our local coffeehouse, where I have done and gone to many a reading, a haven for the genre-enthusiast, shares a building with a shop that caught fire shortly before Thanksgiving. 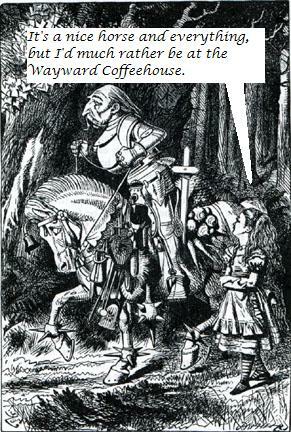 The Wayward Coffeehouse was saved from any fire damage, but suffered from the water and smoke. The building itself has been shut tight since, as the building owners (not the tenants like the Wayward, mind you, the OWNERS) have shown no interest in fixing the damage. It’s an ugly, ugly mess that I don’t know the full details of. But we’re nearing two months since the incident and no progress. I even saw a fortune teller camped out with candles and card table out in front last night. Not like anyone else is using the space. That leaves one of Seattle’s coolest geek hangouts without a home for the foreseeable future while the Wayward’s owner wrestles with legal and financial challenges ahead. For one, I don’t know any other place where you can hang out on a Friday or Saturday night listening to anything from Nordic folk music to horror authors telling tales while enjoying a coffee drink with a geeky name. And dammit, but I miss my gingerbread hot chocolate! NextThere’s editing and there’s EDITING!